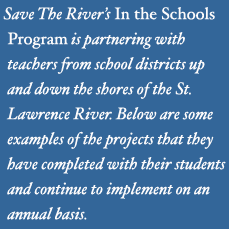 Save the River has been a leading advocacy organization to protect the St. Lawrence River for the past 30 years. It has also organized water restoration and monitoring programs to identify pollution problems. The trustees of FSF encouraged the non-profit to add a hands-on educational experience out of a concern that a whole generation of North Country children might grow up without a love of the river. 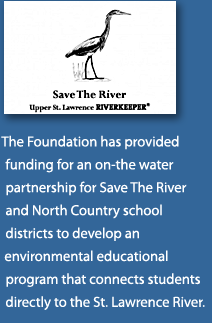 The Foundation has provided funding for an on-the water partnership for Save The River and North Country school districts to develop an environmental educational program that connects students directly to the St. Lawrence River. Over 1000 children have searched wetlands, seen osprey nests and simply gotten to know the river. The goal is to educate and instill life-long interest in stewardship of a precious environmental and economic resource.